No one has faith in the government. Here’s how to use that to your advantage. Since the April 10 release of the March FOMC minutes, the price of COMEX gold has experienced a counter-intuitive drop of over $50. Update: The White House is considering using executive action to redirect federal funds for a larger border wall, regardless of whether Trump signs off on the newly reached bipartisan agreement to keep the government open, according to NBC News. Separately, Trump is keeping the door open to declaring a national emergency to fund the wall. President Trump has not yet decided if he'll support a bipartisan congressional border security deal which provides just $1.375 billion for 55 new miles of border fencing in Texas's Rio Grande Valley area - far short of the $5.7 billion Trump has demanded for his signature campaign promise, reports Bloomberg, citing an administration official. As of Tuesday morning, the White House official said they are waiting to review the full language of the deal. “We don’t know what’s in the document,” Hogan Gidley says, referring to compromise border security deal. While the agreement falls short of Trump's requested figure, the new deal also eliminates caps that Democrats sought on how many border crossers could be detained after being apprehended in the US. In order to avert another partial government shutdown, the new proposal still has to be written into legislation, pass both chambers of Congress, and Trump has to agree to it before Friday night. 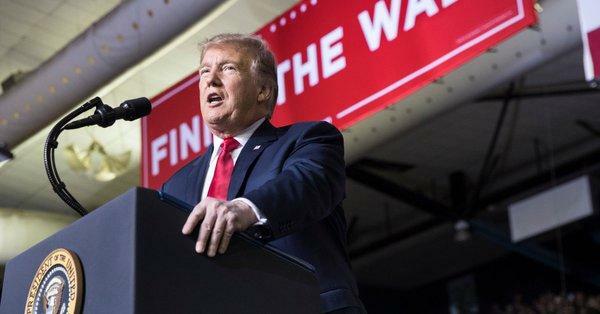 On Monday night, around an hour after the compromise was announced, President Trump took to the stage in the border city of El Paso, Texas for a political rally - telling his audience that he had heard a deal was reached but didn't know the details. He did not indicate whether he would sign the legislation, however he touted the need for a border wall. "Just so you know, we’re building the wall anyway," said Trump. "We’re setting the table, we’re doing whatever we have to do. The wall’s being built." Democratic aides said that they agreed to drop their demand for a cap on detention beds for border crossers detained in the US - and have instead agreed to an average daily cap of 45,274 beds, around 5,000 fewer than the current number of 49,057 who are now detained. According to the deal, Trump can increase the number of beds by reallocating funding from other security accounts to as high as 58,500 beds. Senate Appropriations Chairman Richard Shelby said he thinks Trump will support the deal. "We think so, we hope so." Rep. Mark Meadows (R-NC) railed against the bipartisan deal - texting the Washington Post: "This does not represent a fraction of what the president has promised the American people," adding "I don’t speak for the president but I can’t imagine he will be applauding something so lacking." "This conference agreement is hardly a serious attempt to secure our border or stop the flow of illegal immigration," Meadows told Bloomberg. "It kicks the can down the road yet again, failing to address the critical priorities outlined by Border Patrol Chiefs." Following the announcement of the deal, Treasury futures fell to the day's low as investors sought riskier assets. House Appropriations Committee Chairwoman Nita Lowey (D-NY) said "I hope by Wednesday we’ll have a finished product," adding "Some people may think it’s a great deal, some people may have done it differently, but we did it together and I really think it’s a good product."